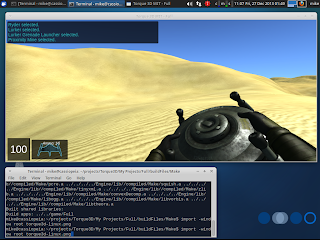 Free Gamer - Open Source Games: Torque3D seems to finally get a Linux port! Following the release of the Torque3D engine under the MIT license (latest release 3.5 here), there was a lot of back and forth regarding a port to Linux (the engine actually used to have a good Linux port, but that one was dropped a few years back). At some point there was even an official Kickstarter crowed-funding attempt, which however failed to reach the estimated funds (but nether the less more than US$10k were pledged). After that things quited down, but several people continued developing a OpenGL renderer and Linux port. Now it seems like all these efforts seem to be near a somewhat usable Linux port or at least that's what I understand by following this forum thread. In the short term the most interesting application of this Linux port is probably that the creator of RotC has announced on his currently running indigogo campaign to liberate (and update) the game, that now there will also be a Linux port. Great news if you ask me, so don't forget to pledge some of that Christmas money you got towards reaching the funding goal (currently $388 out of $1500, with 36 days left). Let's make this happen! Edit (nearly forgot): these two projects related to Torque3D might be interesting to follow: Project GREED and Zentense.